Oliver Callan is an award-winning comedy satirist, who earned his reputation as the creator of Nob Nation, Green Tea and through his multiple appearances on The Saturday Night Show. He is now the resident satirist on RTÉ Radio One, with Callan’s Kicks airing every Friday between 6.30pm and 7pm. The Sunday Independent described his radio satire as worthy of rivalling the legendary Scrap Saturday. Oliver Callan’s Nob Nation comedy albums have gone platinum and he’s sold out live shows at the Olympia Theatre and the INEC Killarney, winning a PPI Radio Award along the way. He’s a regular columnist in the Irish Independent and LIFE magazine. 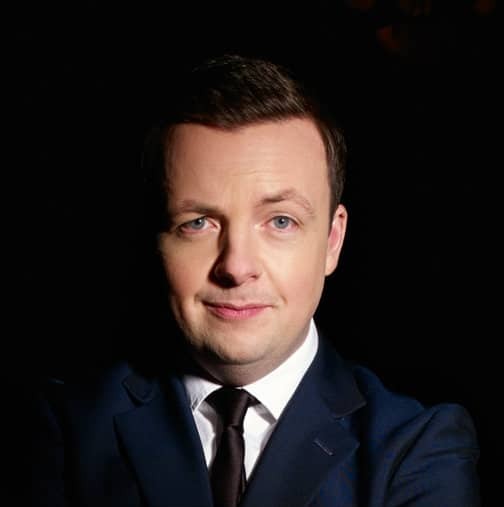 The Monaghan comedian is a hugely popular entertainer on the live after-dinner and events circuit having hosted the FAI International Football Awards, The Irish Car of the Year and performed for Prince Albert of Monaco, Lexus, Audi, Accenture, RSA, An Post, BWG, Musgraves, Meteor and many more.